It’s that time of year again, EA Sports’ NCAA Football 10 hits stores this week and college football fans everywhere will finally be getting their yearly fix. Finally some digital football to distract us from our lives and families before the real thing gets here in mid-August! Video game website IGN.com reviews NCAA Football 09 and thinks this year’s version is pretty impressive. The game continues to increase the overall college atmosphere in the game every year and this season the additions of online 60-year dynasties with your friends/enemies makes the game definitely worth a purchase. Go buy the game from Amazon.com and then add HookEm722 to your Xbox Live friends list if you want to take me on. We’ll be trying to organize an online dynasty on the site soon, stay tuned. About two weeks ago we reported that this is crunch time for the independent roster editors for NCAA 09, which goes to the street today. But as this video â€” of NCAA 09â€™s roster screen â€” shows, using a third-party edited file can can corrupt a teamâ€™s depth chart and its overall rating, if not delete the team entirely, until EA can patch the game. For roster editors, this is a setback in a niche that has prided itself on near-instantaneous turnaround of complete roster files by the date the game drops. EA, weâ€™re told, is working feverishly on a patch to resolve this problem. But for now, anyone who downloads any roster file should avoid editing it; and those who do choose to edit it should do so offline, as doing so online risks corruption and can crash the game, according to our source. Conversations with that source tell of an entire, crucial weekend of work essentially lost. One early-bird editor, working off of a devkit and not a final copy of the game, already got a file out through EA Locker. Other roster editors used it as source for their own files, and discovered the glitch. Even though the original author removed that file, there is still some residual viral spread that could affect unwitting others. It and anything going around right now should be considered suspect until the game is patched. â€œI was assured that when I release my rosters on Friday there shouldnâ€™t be any problems wth them,â€ one editor, who demanded anonymity because of a close, unofficial relationship with EA, told Kotaku. A day-three release of a custom roster file was, to now, considered very late. Now itâ€™s the earliest that a reliable file can be produced. The corruption â€” and this could be a total shot in the dark â€” appears to involve nonstandard ASCII characters in certain playersâ€™ names in the roster file, such as the infamous Aâ€™Mod Ned of Florida International, who memorably waded into a melee between FIU and Miami in 2006 on a pair of crutches. Indeed FIU is one of several teams that go missing, for inexplicable reasons, after changes are made to a roster file that was already created and shared by one editor. While that editor has already removed the file from EA locker, others who downloaded it continue to send it to friends unwittingly. If you intend to game with custom roster files on NCAA Football, you probably should not use them until you see that the game has downloaded a patch from Electronic Arts. …Stephen W. out of Cedar Park. Congratulations to Stephen for being randomly selected as the winner of a copy of NCAA Football 09 courtesy of Bevo Sports. Stephen entered our game giveaway contest simply by sending in his name and email address and now he’s being shipped the Xbox 360 version of the game. He’ll have the game soon and should be playing in a new online dynasty as the Horns by the end of the week. Thanks to everyone for entering the contest and for reading the site. Keep tuning in here for more great content, all new features, and the chance at free stuff. Hook ’em! Time’s running out: Win NCAA Football 09! Comments Off on Time’s running out: Win NCAA Football 09! NCAA Football 09 (finally) comes out Tuesday but you have less than 48 hours remaining to sign up to win it from Bevo Sports. No strings attached, no purchase necessary, just fill out one form with your name and email address and you can win the game. Game will be shipped via Amazon.com two-day shipping so it will ship Tuesday and you should have it in your hands for free by the end of the week. The contest ends at 11:59 pm Central time on Saturday July 12th. Go sign up to win now and let Bevo Sports hook you up with your virtual football fix. Reminder: Enter to win NCAA Football 09! Comments Off on Reminder: Enter to win NCAA Football 09! A friendly reminder that you now have less than a week to sign up to win NCAA Football 09 courtesy of Bevo Sports. We’re giving away a copy to one lucky reader for the system of their choice. Whether you have a Wii, a PlayStation 3, or a Xbox 360 we’ll hook you up with the goods. The contest ends at 11:59 pm Central time on Saturday July 12th. Enter to win now and let Bevo Sports fill your summer with joy. Madden 09 screenshot: Vince Young dives for the touchdown! Comments Off on Madden 09 screenshot: Vince Young dives for the touchdown! NCAA Football 09 isn’t even out yet (and we’re giving it away!!) 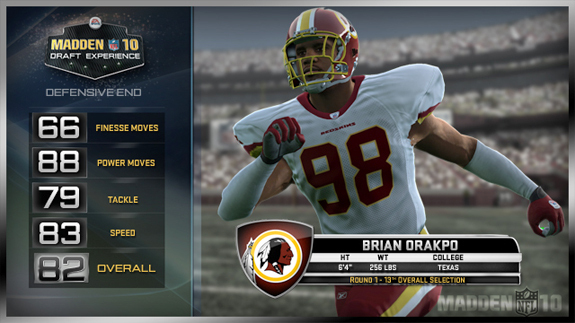 but I’m also getting excited about Madden 09 thanks to some new video and screenshots that have hit the web. Operation Sports has up a ton of new images including the great one above of Titans’ [tag]Vince Young[/tag] diving for a beautiful touchdown at the pylon against the Jaguars. I love the flashes going off in the crowd. It’s accurately catching what really happens, despite the fact that with most cameras that probably means you just took a photo of the guy’s head in front of you. Word from the guys at IGN and Gamespot is that Madden 09 is more than just a roster update, hopefully they’re right and there are some cool new features. Other than last year’s version (which I bought just because Vince was on the cover), I’ve been buying NCAA and renting Madden every year for a while. There will have to be more than a rewind/cheat feature to make me purchase the game this year.